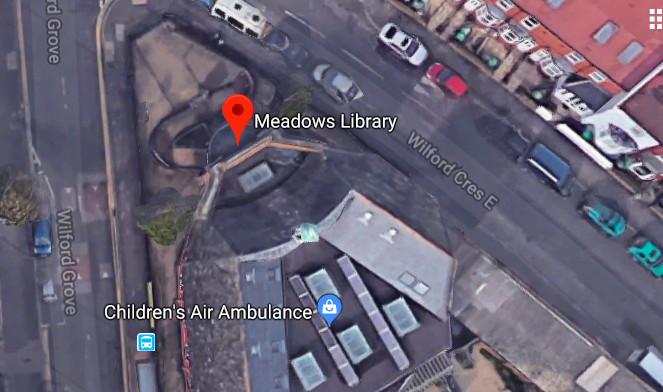 By far the fanciest library on the network, the Meadows library branch is housed in a delightfully wedge shaped building imposing (in a nice way) on a street corner in one of Nottingham less affluent neighbourhoods. The Meadows has good memories for me. I moved to Nottingham in December 2000 and lived in an area called Bobbers Mill. The house I rented was sad, damp and lonely, my cat, Scoff, disappeared one rainy day never to been seen again (I expect someone else took him in). I got behind with the rent, I drank too much and I didn’t know anyone at all outside of work, which was a fairly soul destroying telephone based technical support job, 4 days on 2 days off with night work. My little brother was at Uni in Nottingham at the time, and in May 2001 we decided to move in together in the Meadows. A much bigger house, with lower rent, near the river and a big park, we even found a 3rd house mate an old home town friend, the 6’6” tall Chris, who was about to become a policeman in London. The Meadows, and the change of lifestyle was like a breath of fresh air, my dark moods changed immediately and it was probably a big turning point in my life, not necessarily for the better, but certainly to the next phase. At that time I must have walked or cycled past this library a couple of times a day. I’d never been in until now. The Meadows branch library has clearly been refurbished in the recent past, and some good money spent on accessibility and modernisation. It’s an extremely pleasant space to be in, warm and light. It was a little too warm on the day I went in, but that’s more about my preferences than the space itself. As usual the library was well occupied, annoyingly for some of the patrons who came in, every PC terminal was in use, with the users more or less camped out on them. One three or four occasions, someone put their head around the book stack and tutted audibly when they saw the terminals were all full. If you think about it, that’s the equivalent in modern terms of their being a queue out of the library door. These folks for one reason or another do not have access to their own laptop or smart phone even and for whatever reason, want to access the internet in this public space. It makes me wonder if provision of tablet or Chrome books might not be a good model for expansion? One chap I couldn’t help noticing, was watching some streaming video, and why not. Video is a GREAT teacher. It comes down to “what is the mission of a library”? Is it the provision of resources? Is it all about reading real books? I think that is the question that is foremost in my mind. What is it for? Who is it for? As usual I had no difficulty at all logging into the Wifi and the speeds were good. I wasn’t presented with any power sockets but that’s not really a problem for me. The raised bench top I worked from faced a window looking out onto a lovely garden, which is apparently part of the library. Yes, THIS library has an outdoor reading area! The reading garden at the back of Meadows Library. It makes me pretty happy that this building, which is a fine library building, continues in use. I think the modernisation that’s been achieved is very good indeed. I’m unsure if the positioning of the new Central Library building, not so very far away from this, will affect future considerations for the Meadows site. Hopefully not. I’m going to go out on a limb, and say that this, closely followed by Sherwood branch, are my favourites so far. However I do have the also original library buildings of Radford-Lenton, Basford Library and Aspley Library, all of which I consider to be architecturally special. Today’s thumbnail is a front view of Meadows Library.